(Newser) – If Taco Bell can stuff a tortilla with three different types of Doritos, why not a candy bar filling for a quesadilla? 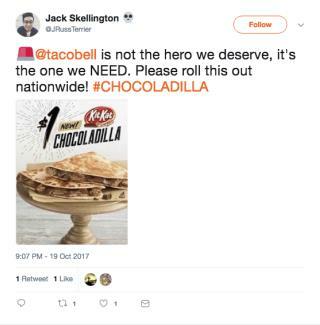 Consumerist reports the latest offering from the taco chain is a "Chocoladilla" packed with bits of melted Kit Kats or Twix. And all that mouthwatering goodness will sell for only $1 per sample. "Our mouths are already watering," says FOX6 in Wisconsin, where the candy delicacies are making a test run. How bout an Elvisadilla with bananas & peanut butter, grilled then frozen? Coming to a fair near you. honestly the most digusting thing ive seen in a while. why are people so goddam weird with food? like the people who eat the octopus' while they move from the soy sauce. So gross. PSA: be more normal with food people. Get back to me once you've figured out how to deep fry it like an empanada and drizzle it with caramel sauce.